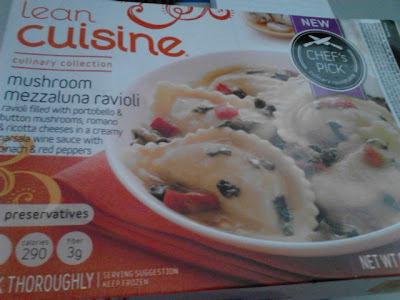 Frozen Lunch Review: Lean Cuisine Mushroom Mezzaluna Ravioli | The Food Hussy! I go through so many routines when it comes to my work eating routine - it's not even funny. It's just ridiculous. Sometimes I eat breakfast out and then pack my lunch every day. Sometimes when I pack my lunch - I can't stand the thought of anything frozen - other times - it's all I want. Right now - I'm in a phase where I bought a 6 pack of english muffins and a jar of peanut butter and - voila - breakfast for a week! I'm also in the mood for frozen lunches - who knows why? When I was perusing the Lean Cuisine selections at Meijer I cam across this one - Mushroom Mezzaluna Ravioli. Hmmm - I like mushroom, I like ravioli - let's try it! Then I opened the box - oye - I thought it looked awful! Too much spinach! I was kinda disappointed and somewhat grossed out. But hey - I was hungry and I went for it. So how did it go? Flavor - So good!!!! I was thoroughly shocked at how good. It was mushroomy and the sauce was full of flavor. The marsala wasn't overpowering (I'm not a huge fan) but was nice and creamy. 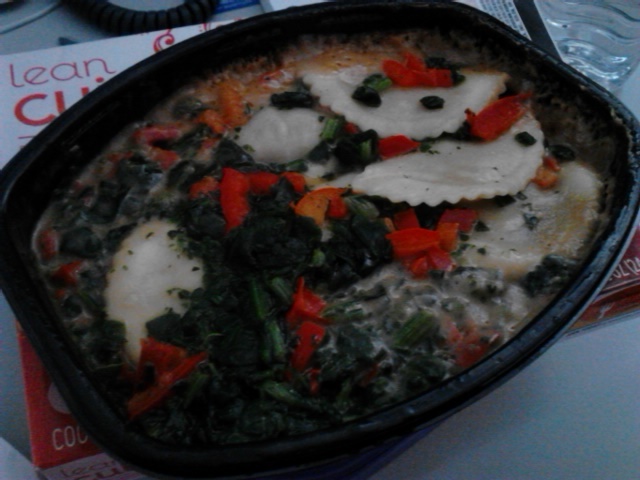 Well done Lean Cuisine! Meat - there's no meat here! Allergens - milk, egg and wheat - the trifecta! Fullness Factor - it was fine - I had my english muffin breakfast so I was already pretty full. I definitely will be purchasing this one again - I could eat this a couple of days a week! Go try it!